Friedrich Nietzsche – the Philosopher of the Third Reich? The German Philosopher Friedrich Nietzsche was born on October 15, 1844 in Röcken bei Lützen near Leibzig. His father was a Lutheran church minister. After his secondary schooling he went to the University of Bonn to study Theology and Philosophy. But he was not really interested in these subjects so he changed to Philology. Nietzsche was also very interested in music. In his early years he read the German romantic writer Friedrich Hölderlin and later on Schopenhauer. 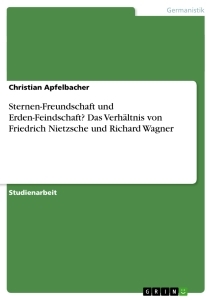 Friedrich Nietzsche began very early with his writings, mostly commentaries about ancient Greek philosophers. In January 1971 he started with one of his own big works, Geburt der Tragödie. Untill his physical collapse, Nietzsche wrote a lot of books and gave us a huge body of philosophical work. In his writings he proclaimed the death of god and a new kind of human super being; he wanted to establish a new moral understanding without a Christian background. When we read his books we often hear about Übermensch, Wille zur Macht und Umstürzung aller Werte. Hitler used these and other early writings about Jewish people to justify his ideology and his genocide. We do not know if Hitler ever read Nietzsche but there is a similarity between his writings and the writings of Nietzsche. Nazi philosophers and anti-Nazi philosophers have argued over Nietzsche. Who was right? Throughout history a lot of people have wanted to establish whether Nietzsche can be blamed for Nazism or not. When we go through the writings of Friedrich Nietzsche we find a lot of similarities between his thoughts and the thoughts of the Nazi-Ideology but, it is important to remember, Nietzsche was already dead 33 years before the Hitler-regime came into power. Nietzsche did not know anything about this horrible ideology. Therefore is it fair to judge his philosophy in the light of Nazism or even to blame Nietzsche for it? In his essay: A Godfather too: Nazism as a Nietzschean “Experiments, Fischer writes how important it is to realise that the “‘real’ Nietzsche was not the historically effective Nietzsche”. Fischer wants to look at the Nietzsche before Giorgio Colli and Montinari wrote their critical edition. Fischer always has in mind, that the “historically effective Nietzsche can be read from two opposite perspectives with two opposite results, both as a proponent and as an opponent of National Socialism.” But for him, the real Nietzsche was not too different from the effective one. Golomb/Wistrich has a different view. Nietzsche can not be reduced to one single ideology. His philosophical work is much more complicated. “The ambiguities and contradictions in his work as well as his elusive, aphoristic style lend themselves to a wide range of meanings and a multiplicity of interpretations.” It is not easy to give a correct view of Nietzsche’s writing. Like Golomb/Wistrich comment, there can be a lot of different interpretations of his view, but it is also important to have in mind, the historically effective Nietzsche. There are anti-Nazis that proclaim a connection between Nietzsche and the Nazis and also Nazis that see him as their forerunner. But it is interesting that there were a few Nazis-scholars, who denied such a connection between their ideology and Nietzsche. And in the end Anti-Nazis have denied that there is a connection between Nazism and Nietzsche’ thoughts.